Not his saunter down the beach toward her. Not his unbelievable pick up line. Not the instant, undeniable connection. And not his wings. Now trapped between life and death, cursed to spread chaos with her every touch, Eden could be the key in the eternal struggle between heaven and hell. All because she gave her heart to one of the Fallen, an angel cast out of heaven. She may lose everything she ever had. She may be betrayed by those she loves most. But Eden will not be a pawn in anyone else's game. Her heart is her own. And that's only the beginning of the end. I have deep interests in ghosts, the afterlife and angels. It’s not easy to pick up a YA book that can easily feel that need of mine. I really wasn't expecting much when picking up A Touch Mortal. I was terribly excited about the concept but wasn't sure anyone could pull off something original, something to make my gears turn again. I had never finished a book based on the afterlife, I was looking for something to change that. I was very pleased with this book. It was nice to pick up a book with twists and turns that actually took you by surprise. It was a beautiful debut novel. I can’t wait for the sequel. 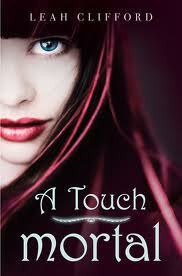 A Touch Mortal isn’t a small book, it’s a book you want to dedicate a book to because I assure you won’t want to put it down! Leah Clifford has been an extreme cave tour guide, a camp counselor, a flight attendant, a pizza delivery girl, a waitress, and a grocery store clerk. Now she adds author to that list. She lives outside Cleveland, Ohio. This is her first book. You can find Leah on her website and Twitter. I need this book, like now! Great review. I have several pages to make life eaiser; if you're looking for a past review check out my Review Archive. If you would like to have your novel featured on the site click here. © Devyn Burton. Simple theme. Theme images by blue_baron. Powered by Blogger.